Originally named the Award for the Outstanding Latin Program in New York State, this award was first given in 1994 (CAES' 30th year). In 1999 the award was renamed: The June U. Stillwell Founders Award for the Outstanding Latin Program in New York State. 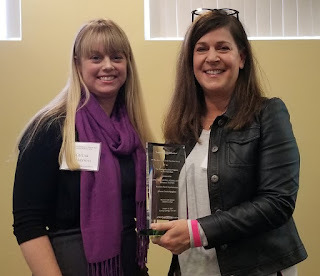 At the 2018 institute, CAES, represented by Katie Finlayson, presented the Gates Chili Central School District with the 2018 June U. Stillwell Founder’s Award. Jeanne Quagliata received the June Stillwell Founder’s Award for the Gates Chili Schools.